Dying together's even more personal than living together. 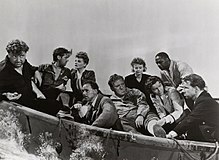 Lifeboat is a 1944 film about several survivors of a torpedoed ship who find themselves in the same boat with one of the men who sank it. Directed by Alfred Hitchcock. Written by Jo Swerling, based on a novella by John Steinbeck. We're not like you! You're made of iron, we're just flesh and blood! Hungry and thirsty flesh and blood! [seeing a bejewelled Connie in a fur coat as he enters the lifeboat] Connie! Did you come from the freighter or the Stork Club? My name is Schmidt, but I changed it to Smith. That's what I got against these guys more than anything else. They make me ashamed of the name I was born with. I got a lot of relatives in Germany. For all I know this guy may be one of them. I say throw him to the sharks! I'm a great believer in science. Connie Porter: [speaking of the disaster] Reminds me of an air raid once that hit me in Chunking. John Kovac: Reminds me of a slaughterhouse I once worked in in Chicago. Those Nazi buzzards — a tin fish ain't enough. They've got to shell us too! Gus Smith: [referring to Willie] A guy can't help being a German if he's born a German, can he? John Kovac: Neither can a snake help being a rattlesnake if he's born a rattlesnake! That don't make him a nightingale! Get him out of here! John Kovac: As of now I'm skipper, and anybody who don't like it can get out and swim to Bermuda. What about that? Gus Smith: I'll buy it. Stanley 'Sparks' Garrett: Suits me. What about you, Miss? Alice MacKenzie: I'm for it. George 'Joe' Spencer: Yes, sir! Charles D. 'Ritt' Rittenhouse: Well, if the rest agree. Connie Porter: All right, Commissar, what's the course? Willy: [fixing her diamond bracelet] Looks like bits of ice. Connie Porter: I wish they were. Willy: They're really nothing but a few pieces of carbon crystallized under high pressure at great heat. Connie Porter: Quite so, if you want to be scientific about it. Willy: I'm a great believer in science. Connie Porter: Like tears, for instance. They're nothing but H2O with a trace of sodium chloride. Who goes Primitive first...A man...Or a woman...adrift in an open boat? What happens when six men and three women are alone in an open boat? Six men and three women — against the sea and each other.